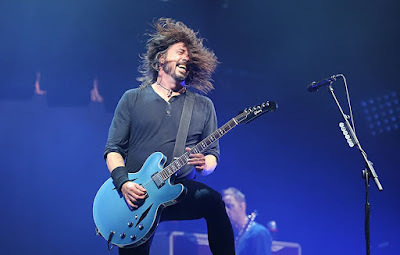 Dave Grohl will host the Halloween episode of ABC-TV’s Jimmy Kimmel Live on Tuesday, October 31. The Foo Fighters frontman will be joined on the program by actress Kristen Bell and musical guest Alice Cooper. Grohl will sit in during a week of guest hosts in place of Kimmel, who is off with his family as they prepare for heart surgery on his infant son Billy. "As a precautionary measure, the scheduled second heart surgery for Jimmy Kimmel's son Billy had to be postponed this week due to the common cold,” said a show representative. “Jimmy is very grateful to Shaquille O'Neal, Dave Grohl, Channing Tatum and Jennifer Lawrence for filling his very small shoes as guest hosts this week while he, his wife and children sneeze on each other." Billy underwent the first of three planned heart surgeries just three days following his birth in April after being diagnosed with a rare congenital heart defect. Grohl and the Foo Fighters are currently playing dates across the US in support of the recently-released "Concrete And Gold" album, which debuted at No. 1 on the Billboard 200. The fall shows will wrap up in Salt lake City, UT on December 12. UPDATE: Watch Dave GRohl host Jimmy KImmel Live here.